We are very proud of both our Take Stock Alumni and our Mentors. In the spring of 2017, Johnny Louis (Take Stock in Children, Monroe County class of 2012), received a Bachelor’s degree in Engineering from Florida International University. Johnny credits MCEF and, specifically, his mentor Timothy Gaffney for helping him stay on track. In addition, former MCEF board member Edward Pitts worked hard supporting, guiding, and mentoring Johnny, as did Jim Hall and Dresdin Bray-Edwards (program coordinator and assistant coordinator while Johnny was in middle and high school), and many, many community members. The Monroe County Education Foundation could not be prouder of this hard-working graduate! Beginning at age four, Christina was raised in a single parent household. Being the one of the oldest of four children, she was assumed many responsibilities at a young age, but she had tremendous support from her mother. Education came first. When Christina was in second grade, her mother went back to school to earn her degrees. Since sixth grade, Christina knew she wanted to be a teacher, but she didn’t know how college would be financially possible. That changed with Take Stock in Children. Her dream of an education became a reality. After graduating from Marathon High School in 2001, Christina earned her BS in Elementary Education from Barry University in 2006, her Master’s in Education from Walden University in 2010, and her PhD in Education in 2018 from Walden University. 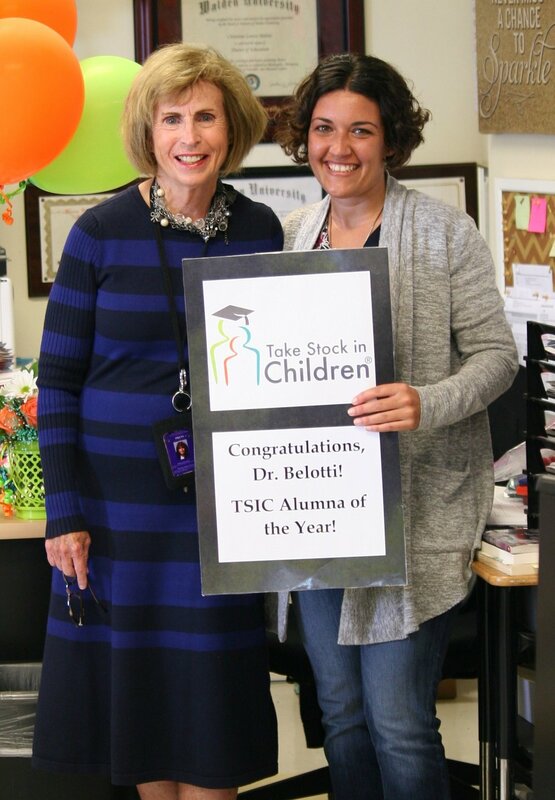 Dr. Belotti is in her 11th year teaching at Marathon Middle High School, her alma mater, making a positive difference in her community, and has been selected as the 2019 Take Stock in Children Alumna of the Year! Phyllis Foster, a life-long educator, has a passion for teaching and helping students. A former 3rd grade teacher in New Hampshire, Phyllis served 9 years on the Monroe County Education Foundation board advocating for our economically challenged at-risk youth. She is a Take Stock mentor and a community leader in education.